All sorts of tables and charts can be found that break down how much time people spend on various activities. For example, three minutes (twice a day) brushing one's teeth adds up to 36.5 hours per year, which results in 106.45 days brushing teeth over an average person's lifetime. 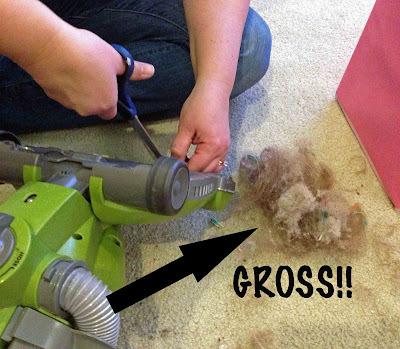 I'd like to know how much time I will have spent hunched over my vacuum cleaner cutting off the hair that's wrapped around the roller. Back to the Snow . . .
HAHA Same thing in my house only it is all my hair! Only thing that is worse it the hair I leave in the drain!! I've posted something on my blog for you, I hope you like it!! here is my remedy - we bought a house last summer - it has all hard wood floors!